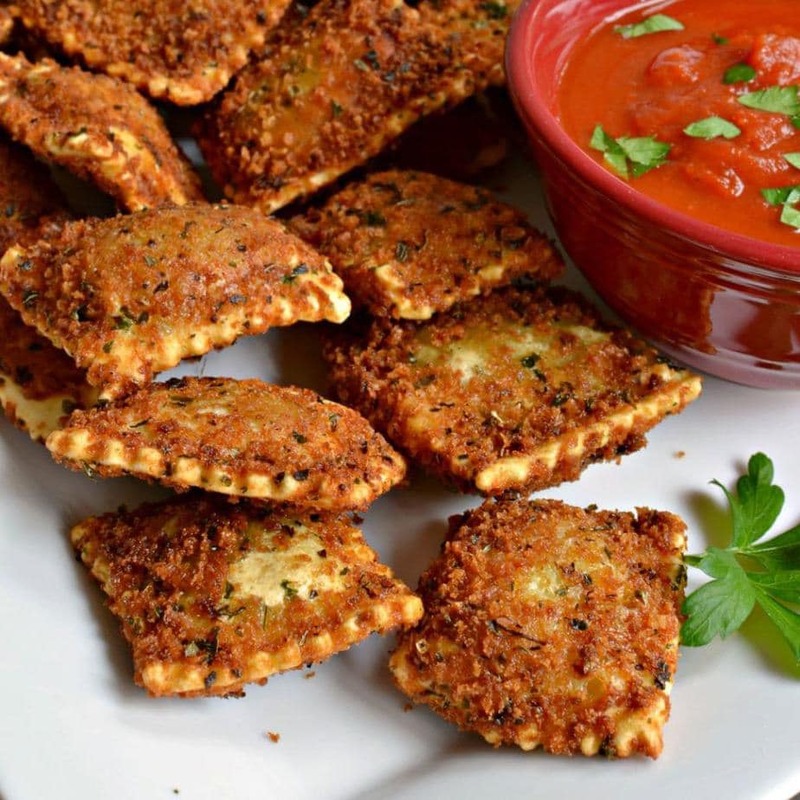 Toasted Ravioli are seasoned breaded ravioli that are deep fried and served with marinara and a sprinkle of Parmesan cheese. These originated in my home town of St. Louis and we continue to make some of the best in the nation. 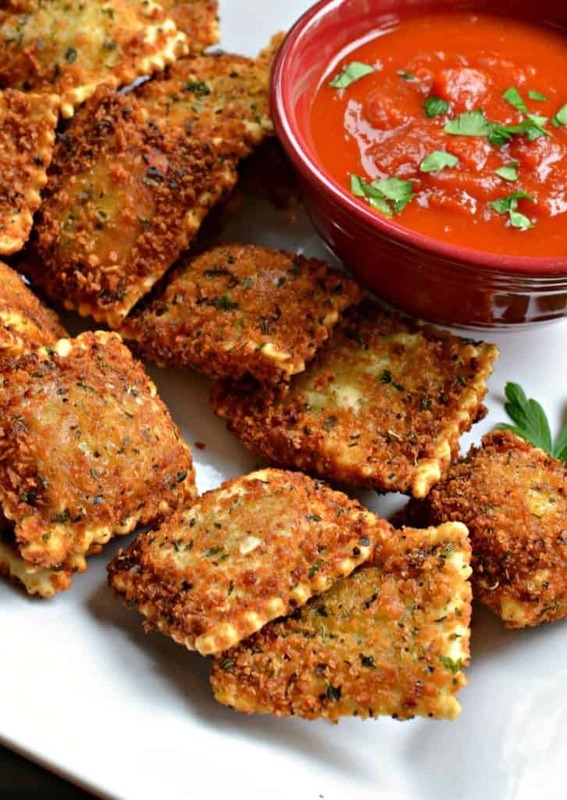 Have you ever tried Toasted Ravioli? If you have not these are must try. Next time you stop in St. Louis visit one of our finer Italian restaurants on “The Hill” and order yourself a delicious appetizer. If you are not a big traveler you can make this recipe right in your own kitchen. It is not difficult at all and you can even prepare them ahead of time and flash freeze them. Store them in Ziploc freezer bags and you have them available for your next shindig. I thought you would never ask. 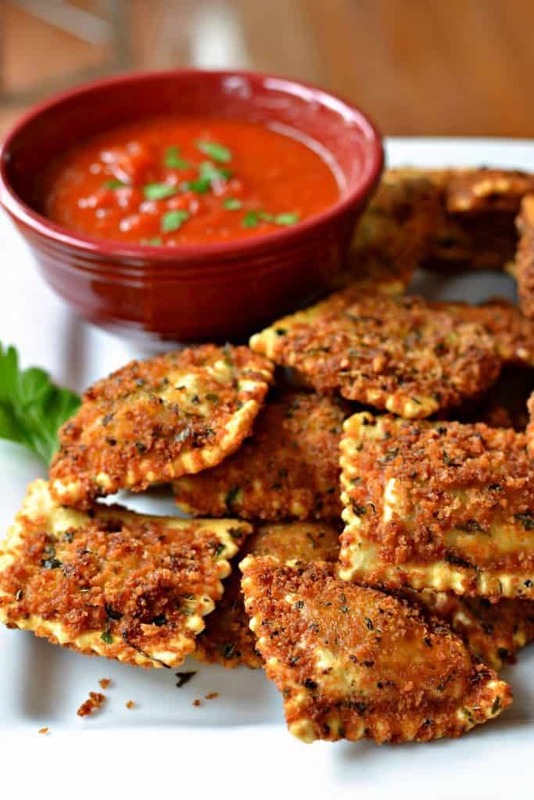 They are frozen ravioli (the kind you would serve with marinara or alfredo sauce) breaded and deep fried. St. Louis tradition is to serve them sprinkled with freshly grated Parmesan and warm marinara but they are also good right out of the fryer. Where did Toasted Ravioli originate? 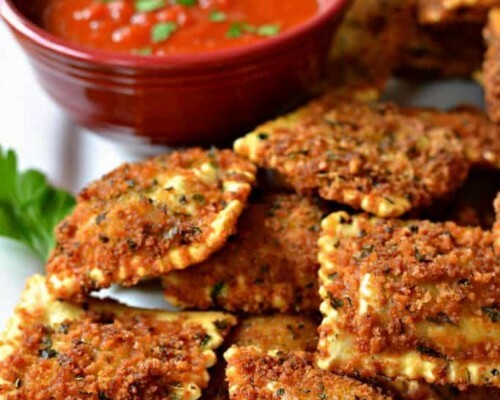 Toasted ravioli were created in St. Louis or at least that is the way the story goes. In the 1940s at one of the restaurants on “The Hill” a cook named “Fritz” accidentally dropped some ravioli into the the fryer. The owner of the restaurant sprinkled them with some Parmesan cheese and sent them to the bar where everyone loved them. I agree with them. They really are delicious. Using store bought frozen ravioli you are going to bread them. First dip them in egg mixture, then in flour, back in the egg mixture and then in the breadcrumbs. Place on a plate in a single layer as you bread them. Finally heat canola or vegetable oil and fry until golden brown. Remove to paper towels to drain. Sprinkle lightly with Parmesan cheese and serve with warm marinara. How to prepare Fried Ravioli for a party. Are you preparing these for a party? It is best to fry them up as needed but the other prep work can be done in advance. You can bread the frozen ravioli ahead of time and place in a single layer on cookie sheets (the raviolis should not be touching). Place them in the freezer until frozen or approximately thirty minutes. Finally place them in Ziploc freezer bags and store in the freezer until your next party! Other delicious appetizer recipes you will love! This post was originally published June 17, 2014 and was republished September 25, 2018 with new photos and new relevant information. Toasted Ravioli are seasoned breaded ravioli that are deep fried and served with marinara and a sprinkle of Parmesan cheese. Mix the eggs and the buttermilk in a small bowl. Combine the breadcrumbs and the garlic on a shallow bowl or plate. Put the flour on a shallow plate or bowl. Arrange them in a line starting with the egg mixture, flour, breadcrumbs and then empty plate. Dip the frozen ravioli in the egg mixture, then in the flour, back in the egg mixture and then in the breadcrumbs. Place on empty plate. Repeat with the remaining ravioli. Heat the canola oil to 375 degrees. Cook the raviolis about five at a time for about 3-4 minutes or until golden brown. Turn halfway through. Remove and place on paper towels. Sprinkle with Parmesan cheese and serve with warm marinara. What kind of Ravioli do you use (cheese or meat)? You can use any kind of ravioli….cheese, mozzarella and chicken, beef. It works with any kind. You can use fresh or frozen. It is easier to bread the frozen ravioli but you can make it work with the fresh as well. Enjoy because they are simply divine. You can use regular milk or you can follow these directions to make a good substitute for buttermilk. I am from St. Louis and they don’t sell them in Las Vegas. I am definitely going to make this recipe. My son misses them too! Thank you! You are going to love them. I live about miles west/northwest of St. Louis. Happy cooking!! Has anyone tried them in the Air Fryer?